Pretty much everyone has those friends that are good at persuasion. They could just about sell you on anything. 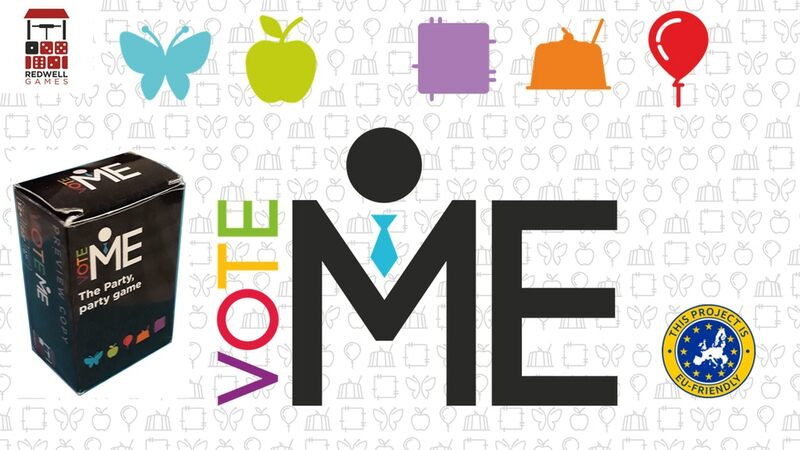 In Vote ME!, you're given odd policy and theme cards that you must spin into being the greatest thing ever, looking to get the votes of your friends. The card game is up on Kickstarter now. Will you join the Blue Butterflies, Green Apples, Orange Jellies, Red Balloons or Purple Patches? Can you win the most votes for your Party by giving the best speech on the randomly chosen Policy & Theme? These could be as diverse as Defence & Toys or Health & Supervillians. Will you give a sensible speech or a silly speech? In the end, you just need to persuade the other players to Vote ME! The game consists of 110 cards, a 60 second sand timer and a dice (for when you want to follow the more challenging option). There are enough cards in one box for up to 10 people play, but for larger groups all you need is extra voting cards (from another box) to incorporate more players. Whilst is is possible to play with over 100 players it would probably be a bit silly. The game is really close to its funding goal with still 15 days left on the clock.